– Podcasts. I’ve yet to figure out if it’s possible to subscribe to podcasts in an iTunesish way. It looks like you can kludge your way through with RSS, but not easily or conveniently. – Weather. There’s a nice looking weather app (omWeather) available, but I can’t get it to install. I’ve made the N810 take the red pill (Nokia-speak for loosening some of the controls) without success. – Twitter. 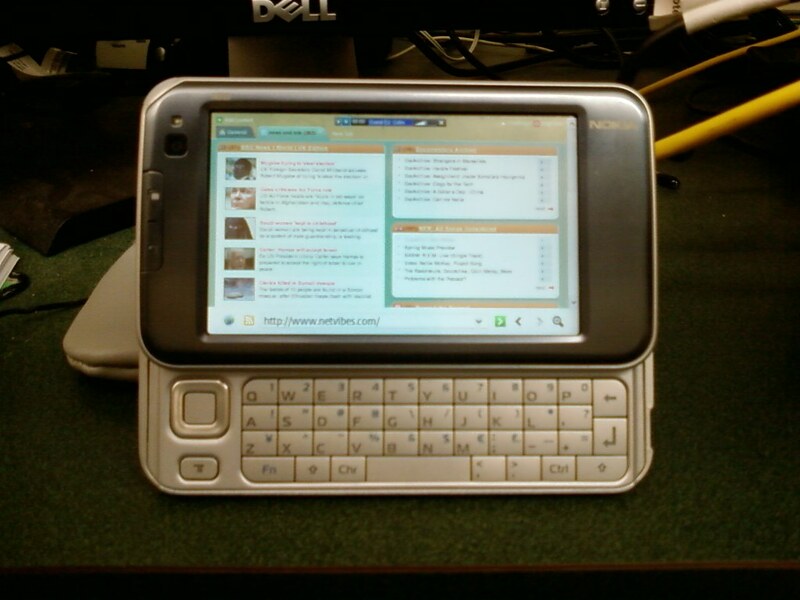 There’s (again,as far as I can tell) no stand-alone Twitter client for the N810. Reading tweets on my cell phone is no big deal, but I just haven’t acquired the numeric keyboard texting skills that I guess I need. I could always go to the Twitter web site, but I’d really like something more like the Twitter widget in Netvibes. Eureka! I’d been thinking about putting a Nokia-optimized Netvibes page together, and yesterday I finally got motivated to do it. Now, if I can just get this self-charging hack to work, I’ll be sitting pretty. 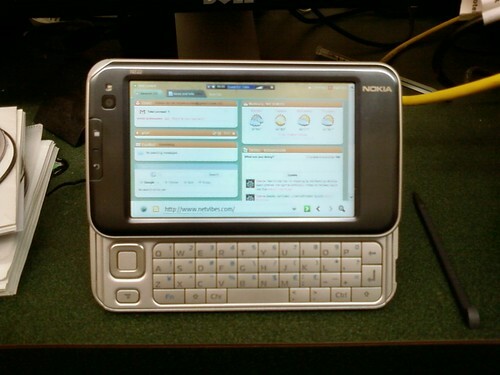 Note – N810 + Wordpy + cell phone camera + texting-photos-to-Flickr = completely moblogged post. This entry was posted in information sys, making things, Type2 by dr.hypercube. Bookmark the permalink. What carriers does it support, and what did it run you? It supports lots of carriers – mainly because it relies on your cell for a data connection – has wifi (direct connect) and bluetooth (tether to a bluetooth cell). Nokia’s theory is that these will be second devices – cell phone for some things (including the connection to the cell data network), internet tablet (what they’re calling these things) for things that require more screen/ability to run more complicated web sites. I’ve got cell/data service w/ AT&T – connecting the 810 through the cell phone is an order of magnitude slower than on an 802.11 net, but still usable (unless you’re trying to do something crazy like Google Docs). It has a GPS too – needs more location-aware stuff, but that will come in time (also a webcam – haven’t done much w/ that yet). I paid $369 for it – and another $25 or so for an 8Gb miniSD card. I was looking at smartphones, but the idea of a cell phone crashing and needing a reboot? Ugh – I don’t need more of that in my life. Give videocenter a try. It’s what I use for this purpose, mainly video podcasts. it’ll download multiple streams concurrently. I’ve downloaded up to 4 at a time. Neill – Thanks, I’ll give videocenter a whirl.